Mrs. Elizabeth (Greenlaw) Roberts of Riverton Road, Winsted, was born June 5, 1907 in Eastport, Maine, daughter of Maine-natives Mae (Kopp) and Charles Greenlaw. 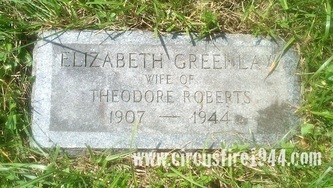 She was found at the circus grounds after the fire on July 6, severely burned over most of her body and in shock, and was admitted to Municipal Hospital where, despite treatment, she passed away just before midnight. 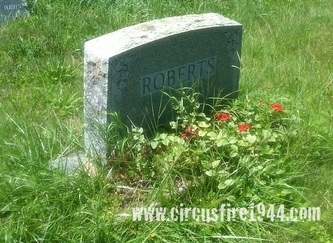 * Mrs. Roberts was buried at Riverton Cemetery in Barkhamsted after services at the Baptist Church in Winsted on July 9. Elizabeth leaves her husband, Theodore W. Roberts, 48, and three children: Theodora, 7; Judith, 6; and Carlton, 4, all of whom were hospitalized with injuries after the fire. 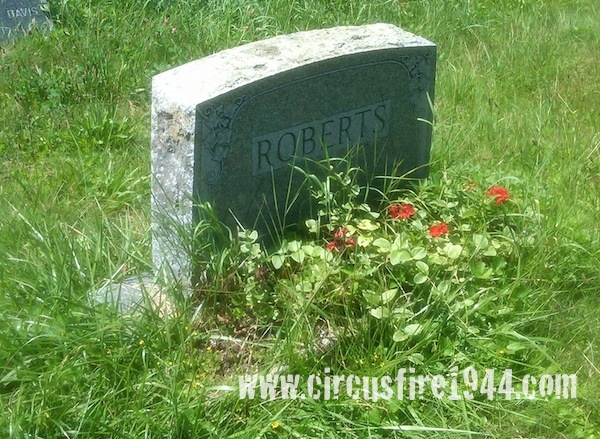 The Roberts family attended the circus together and all of them suffered burns and were hospitalized after the fire, with the children’s injuries being less severe than those of their parents. Elizabeth had previously taught at the Forde School in Robertsville, and had most recently spent her time taking care of the home and assisting her husband with his poultry business, C.S. Roberts & Son. The estate of Elizabeth Roberts was awarded $14,000 by the arbitration board.